Under sunny skies and two days of frost delays the results are in for the 2011 SF City Amateur Championship held at Harding & Lincoln Parks. Patrick Grimes grabbed the medalist spot with two very solid rounds of 68 to post a 136 (-4) total. 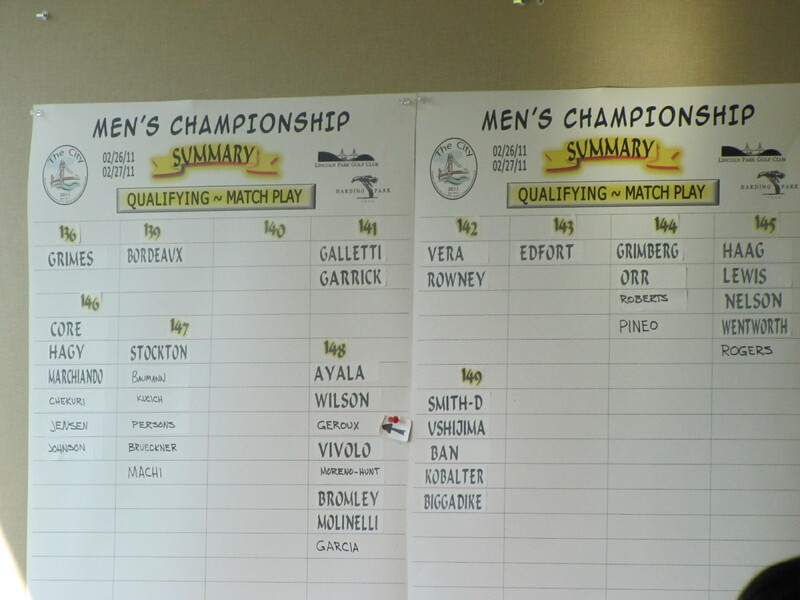 The last three spots will were decided in a playoff at 148 (no results yet available). I was blown away impressed at the improved conditions at Harding Park today. I was expecting wet soggy conditions similar to what we saw last year with no roll and mud balls on virtually every shot. The sanding of the fairways has made a tremendous improvement in the conditions of the course, combined with the unplugging of the drainage that previously was not allowing water to drain out through the main drain and into Lake Merced. I found the fairways to be in the best shape I can ever remember over the past 30 years. The lies were good in the fairway and I didn’t have one mud ball to deal with. Both courses were fairly set up in anticipation of a wet/snowy and cold weekend. 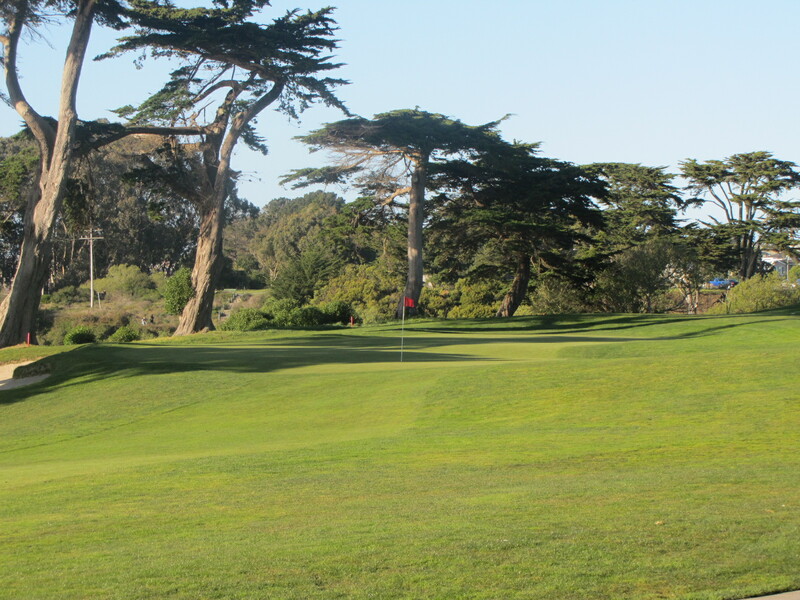 The SF City tournament has done a great job making changes that have made this a better event, specifically the reduction to 32 qualifiers for match play and moving the semi-final match to 18 holes, thus cutting a weekend off this long event. I was fortunate to qualify for match play as I hit the skids for 16 holes (the last 5 holes at Lincoln thru the next 11 holes at Harding) I played these holes an ugly 8 over par without a bogey until I hit my 12th hole of the day (#3 ) were I finally broke the drought, meanwhile knowing that I was on or over the cut line with only 32 qualifiers advancing to match play. This definitely added some additional pressure that I was able to overcome and finish strong to make it into next weekends match play portion of the event. I’ll have more on Harding Park this week as I’ll go over my strategy as how I’ll play Harding during the match play portion of the event. Yay! Praise for the improved conditions at Harding Park!! Thank you! You may not have known, but more than half the fairways have had drainage added over the past year. They did it one fairway at a time with temporary tees to keep the course open. The course hadn’t quite healed by the Schwab Cup, but it’s close to perfect now. While the course is much drier and more firm, the real improvement has been the absolute disappearance of worm castings. Most of the “mud” at Harding was a result of dirt being pulled to the surface by drowning worms. Now that there’s better drainage and a lot more sand, you can’t find a single worm casting. Thanks for the good words about Harding Park!